It was a beautiful and warm day in the L.A. area today, and a great opportunity to visit the gardens at the Huntington Library in San Marino next to Pasadena. It was an exceptionally busy day there today since there was a Shakespeare in the Park festival going on. There were so many people there that in fact that the parking lot was full and people were having to park on the neighboring streets, something I have never experienced before in the dozens of visits I have made to the Huntington.We got lucky though as we decided to cruise the parking lot first and happened to get directed into an open space in the staff parking area! Once we got inside the gardens it didn't seem so crowded, however, since it is such a big place and everyone was spread out. The gardens were looking resplendent in spring glory and color. 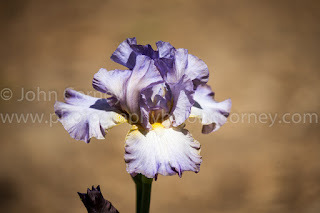 The new entranceway was especially colorful and I have some photos to share from that area another day, but tonight I just wanted to share this beautiful photo I captured of an iris in one of the back gardens over by the conservatory area. I hope you like it as much as I do. I am so sorry I have watermarked it, but I want to put a decent-sized image here for you to enjoy, but have had so much of my artwork stolen from my website and used all around the web that I feel it necessary to do so. Please accept my apologies for having to "graffiti" my own work like this. Who would have thought that there are iris nightlights, but I spotted this on Amazon and thought it looked very cute and would make a great gift for a lot of my lady friends who love purple for a start. In fact, I just ordered two to give as gifts!